Nowadays people don’t want to spend time creating a new account and password every time they visit a new e-commerce website. According to the Research of Consumers Increasingly Interested in Social Login, 86% of users are bothered by the need for creating accounts whenever they pass the website registration process. Modern users are tired of remembering passwords to all their accounts and try to avoid creating a new one if they can’t login via their social networks. It sounds like a bad tendency, if online business don’t offer a possibility to reduce the registration time. First in our top-10 is a website of the very famous US based electronics retailer – Best Buy. As you can see below, their visitors have the possibility to register with Google account on the “Sign In” and “Sign Up” pages. 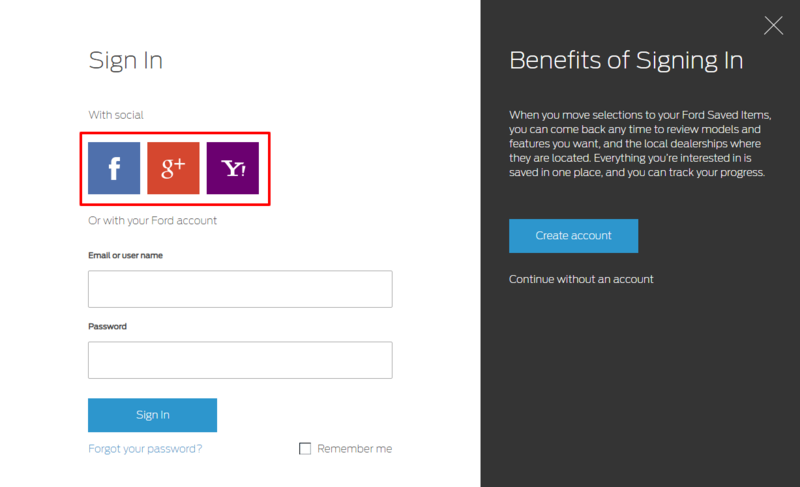 So, if you decide to implement social login into your business strategy and have a social login page similar to Best Buy, you can take advantage of the free Magento Social Login Extension provided by Plumrocket. This is the convenient way to simplify the login process and increase customer registration rates. The company is a British online fashion and beauty store that is popular around the world. 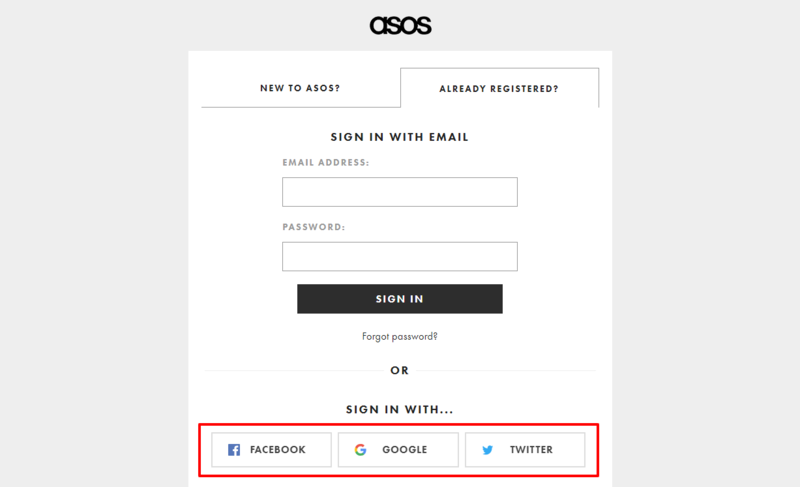 Asos offers customers to “Sign In” and “Sign Up” with Facebook, Google+ or Twitter. 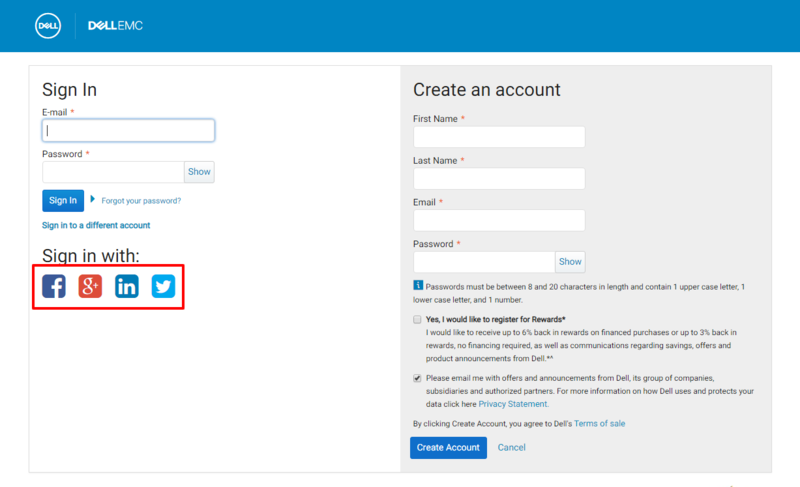 Also, the website includes a note why social login is a great way to create a new account: “Signing up with social is super quick. No extra passwords to remember – no brain fail. Don’t worry, we’d never share any of your data or post anything on your behalf”. This organization is the site of a private for-profit corporation that owns a chain of American art and craft stores based in Oklahoma City. This site has only one easy way for customers to sign in with Facebook on the registration page. This online shop is the website of an American retailer of crafts and fabrics based in Hudson, Ohio. 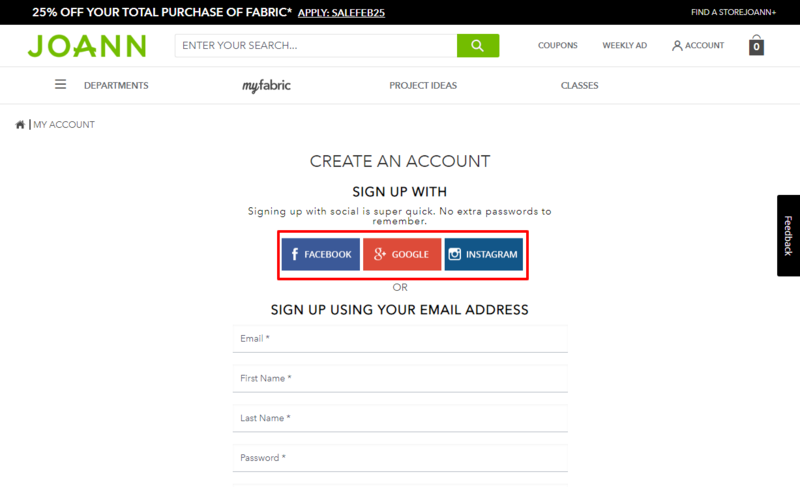 Joann’s customers can create an account or “Sign In” with the most popular social networks: Facebook, Google+ or Instagram. Note, it is important to remember that the process of choosing the social login networks for your website should be based on the customers’ social media preferences. For instance: if you have an online fashion store or any other women-related business, it is suggested to include social login via Instagram. 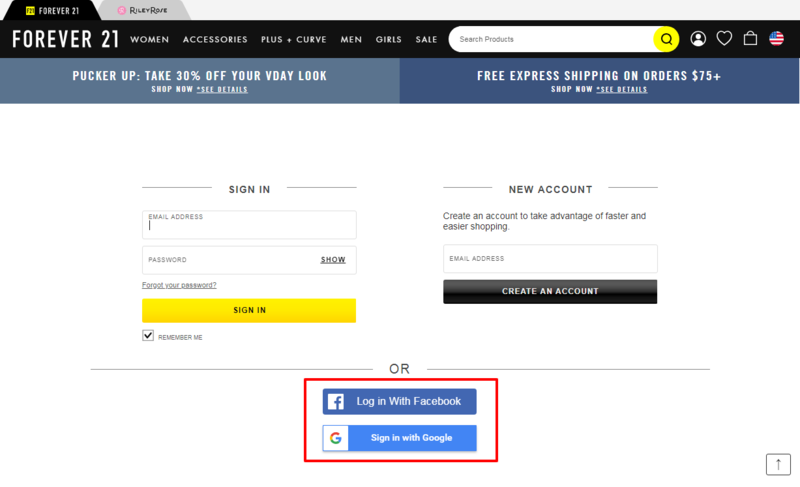 In case you run the online shop to buy electronics, the implementation of Google and Twitter social login options can be a great idea for keeping the clients engaged on your website. The American multinational corporation is engaged in the design, development, manufacturing, worldwide marketing and sales of footwear, apparel, equipment, accessories, and services. The company is headquartered near Beaverton, Oregon, in the Portland metropolitan area. They use their popup window for “Sign In” or “Create an Account” forms. Their clients only have an option to create accounts with Facebook. Headquartered in Seattle and launched in 2009, Washington, the American e-commerce company sells clothing, toys, and home products. The company uses the popup window for “Sign In” or “Create an Account” forms. If you don’t have an account on Zulily, you will be unable to use the whole site. Zulily has a feature that the popup window can’t be hidden without registration. 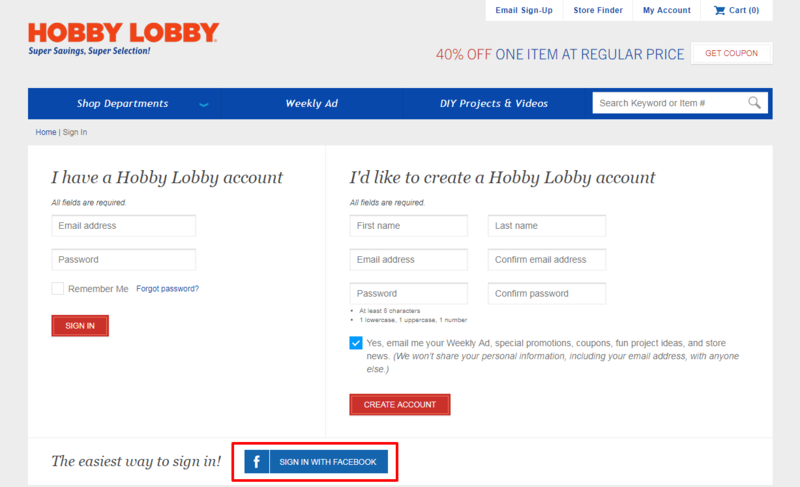 This site has only one easy way for customers to sign in with Facebook, besides the traditional form of registration. The American multinational automaker is headquartered in Dearborn, Michigan, a suburb of Detroit. Ford customers can sign in with the following social networks: Facebook, Yahoo! or Google+. If you want to implement the social login for e-commerce functionality on your Magento store via different social networks like Ford, it is recommended to use the effective Plumrocket Social Login Pro Extension. This module offers your visitors to sign in via more than 50+ supported social media networks, as well as enhance user experience and increase the conversion rates. Dell.com is the site of a multinational computer technology company based in Round Rock, Texas and is one of the largest technology companies in the world. Their customers can sign in with Facebook, Google+, Linkedin or Twitter. Founded in Los Angeles, California, this famous American fast fashion company sells trendy clothing at low pricing. 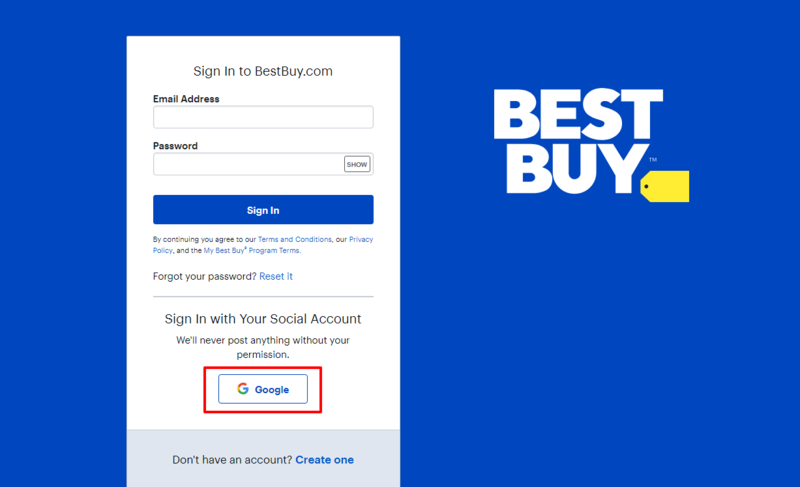 If you want to perform a quick “Sign Up” and “Log In” on the company’s website, you can take advantage of your Facebook or Google+ social networks. Launched in 1999, the company is a popular e-store that deals with designer shoes, clothes and accessories for men, women, and kids. In July 2009, Amazon acquired Zappos in an all-stock deal worth around $1.2 billion. 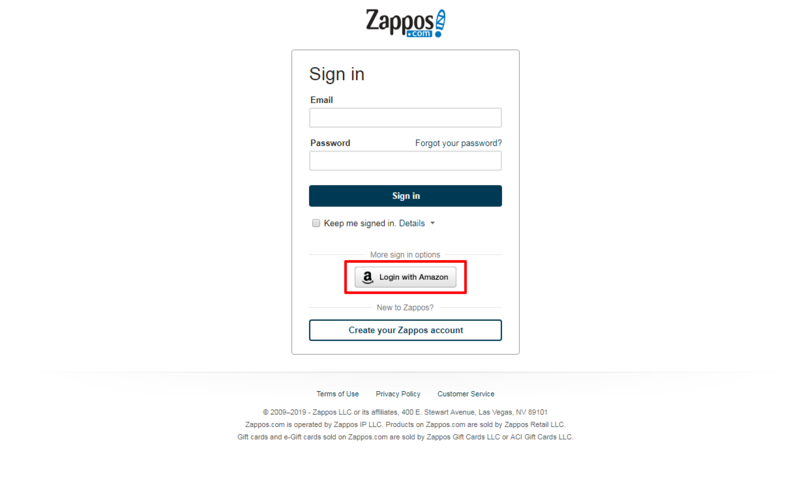 So, you can use your Amazon account to “Sign Up” or “Sign In” to the website. As you can see, social login for e-commerce is used by various online stores for streamlining the registration process, improving user experience and boosting sales. 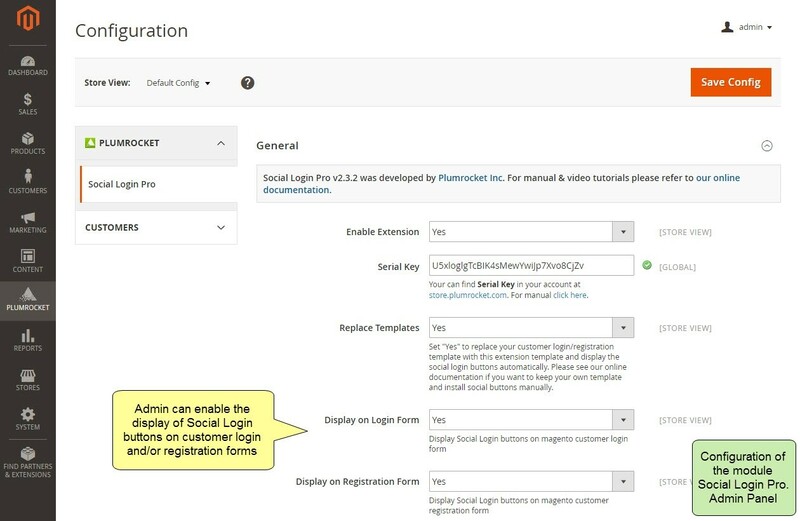 So, if the above -mentioned examples convinced you to use social login on your website, then Magento Social Login Extension provided by Plumrocket is your option to consider. 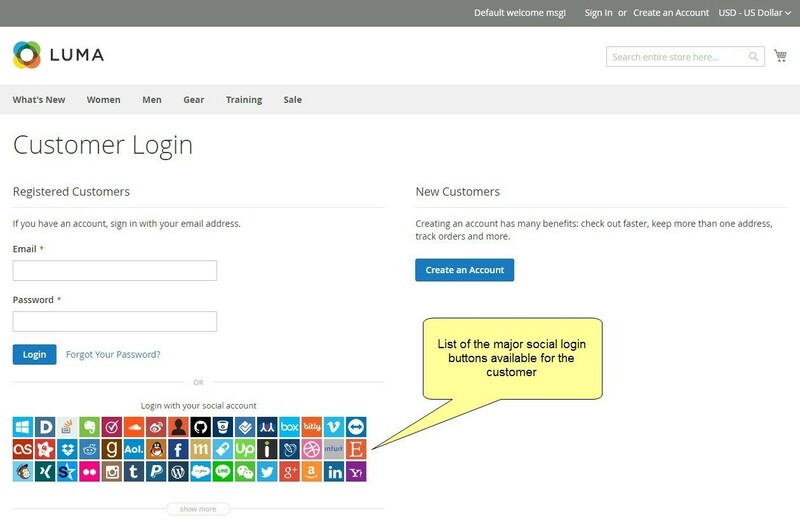 Make user experience even more convenient by using any Magento themes with social login tool, and much more. As you can see, Magento Social Login Extension can help you accelerate customer engagement, gather personal information to run targeted marketing campaigns, use website social share to promote your online shop, etc. So, in case you want to learn more information on the plugin and check the features of the service, you can run a free demo or explore the documentation. Today’s e-commerce companies use various ways to stay competitive and make the business successful. So, if you want to achieve the desired results, social login is considered one of the imperative tools to include into your business strategy. 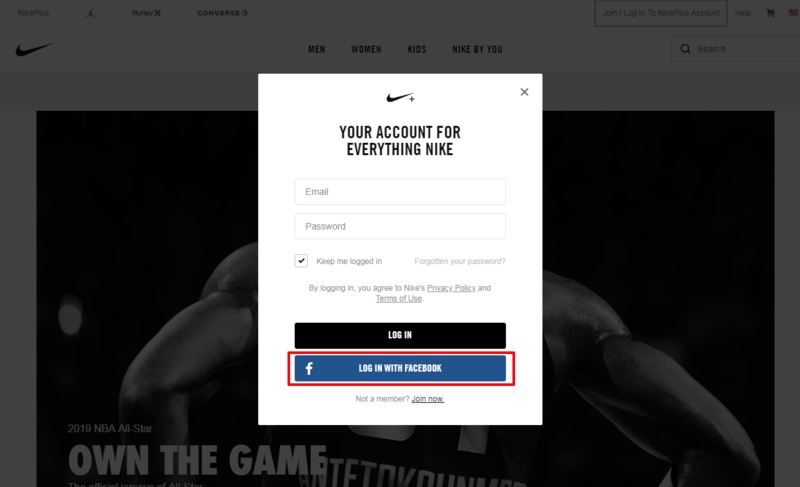 The above-mentioned examples of social login implementation can help you understand the importance of the service, and provide you with an opportunity to select one of them for your e-store website. Hence, offer a choice of “Sign Up” and “Sign In” options and give customers control of how they want to interact with your organisation.